The first Steering Committee meeting of 2019, held in Brussels on 6-7 February, focused on priorities and actions for the upcoming year. 2019 is special in many ways. As the EaP policy initiative celebrates its ten years, there are a number of elections on their way: not only in the EaP region, but also in the EU itself – with European Parliament elections scheduled for May. This provides a time for self-reflection and reassessment of current goals and activities, prompting a discussion on future objectives from national governments and EU institutions. While the EaP countries show some progress on 20 Deliverables for 2020, the societies in the region are still facing major obstacles in their transition. Civil society in Armenia faces a growing disappointment, as the new government is not engaging enough with CSOs – civil society organisations of the country. In Moldova, Parliamentary Assembly of the Council of Europe (PACE) observers report intimidation and some instances of vote buying – ahead of the Parliamentary elections, scheduled for 24 February 2019. In this regard, the Steering Committee urges international actors to watch the situation closely, a message which has been repeated in their statement. While Ukraine is (also) preparing for the Presidential elections, the situation around the Azov Sea is still tense. The Steering Committee released a separate appeal on the Sea of Azov – pointing to the unresolved issue of captured 24 Ukrainian servicemen and its aftermath, which continues to negatively affect the region. The situation remains particularly restless in Azerbaijan, which saw street protests and rallies on 26 January 2019. The new charges against Mehman Huseynov, the reason for this mass mobilisation, were eventually dropped – but the case helped to draw attention to the situation of political prisoners in the country. EaP CSF Steering Committee did not remain silent on this matter – and released an additional statement, voicing their concern about over 100 reported political prisoners held in in the country. Freedom of press and human rights remain a dubious question in Belarus – where civil society expects preventive repressions towards press, civil society and activists, ahead of Freedom Day on 25 March 2018. Despite some of these negative developments in the region, the Steering Committee remained optimistic in their meeting with the external stakeholders from DG NEAR and EEAS. Both parties addressed the question of how to make most of the upcoming commemorations, as well as to mark the policy’s direction for the years to come. They asked how to draw synergies ahead of milestone year 2020 and bring in civil society’s involvement in line with its 2020 Deliverables. 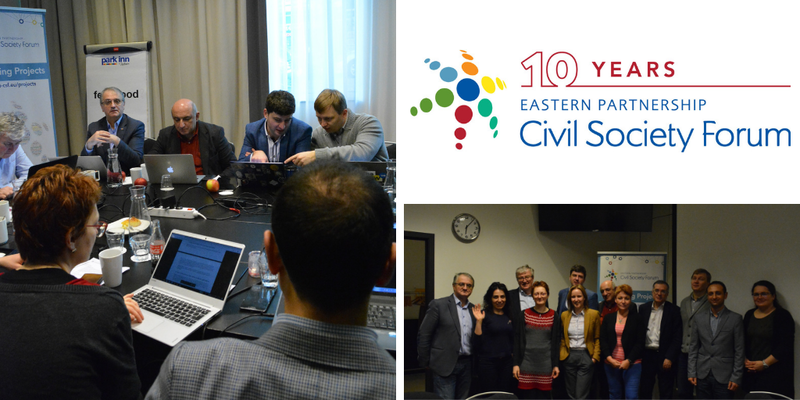 Looking closer ahead, the stakeholders pledged to include civil society in the 10th EaP anniversary celebrations – spread out in 40 events in the EU and EaP region throughout the year, culminating in a high-level conference and concert in May. As for internal issues, the Steering Committee evaluated the outputs from the last Annual Assembly in Tbilisi, the role of the recently elected Arbitration Committee, gender mainstreaming within the structures of the Forum and some of the changes brought by the Internal Reform, which came into force on 1 November 2018. The Steering Committee also reviewed the outcome of this year’s Re-granting calls. The newly published EaP Index was also presented during the meeting – its formal Brussels launch is planned for 26 February 2019.